Today I want to share with you another handmade gift we are giving out this Christmas. We always buy the main teacher in each of the girls classrooms a gift card, but if we sent those to every aid and helper they love at school, we would be broke! I am a huge fan of bath and body products, but those can get quite pricey too. So, what's a mom to do? I hopped on Google and found a bunch of homemade sugar scrub recipes that would be perfect. They are very inexpensive to make and so easy the girls were able to make them all on their own. 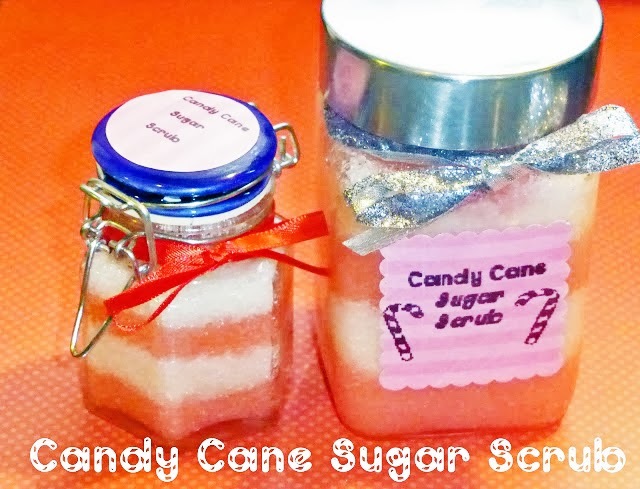 I found this Candy Cane Sugar Scrub recipe from The Idea Room. I ended up making a batch for myself and can tell you, this stuff is wonderful! After I use it, my skin is super soft, which I can't say often in these dry winter months! Mix the sugar and almond oil together in a bowl. Add a few drops of peppermint oil. Put half the mixture in a separate bowl. In one bowl only, add a few drops of cherry juice at a time, mixing as you go until you get your desired color. You now have one white colored sugar scrub and one pink scrub. Fill a jar with each of the scrubs, alternating colors evenly, and packing it down as you go. Add a pretty ribbon and a label and you have a cheap, but wonderful handmade gift. If you like this Candy Cane Sugar Scrub, be sure to check out the Brown Sugar Body Scrub Recipe too! What an amazing idea. For me, getting homemade gifts like this is so much more meaningful. It sounds easy enough to make, too, but I am already done with my shopping for this year. I am gonna bookmark this for next year, though. Something like this would even make an awesome teacher gift. That is a wonderful gift idea, and I like the idea of cherry juice to keep it 100%. Oh this is awesome!! I actually just ran out of a wonderful coconut sugar scrub that I bought at a salon quite a while ago so this is perfect timing. I never thought about making my own! I've always dropped big bucks on sugar scrubs too. I never knew how easy and inexpensive they were to make at home. And they work so well too! These sound great! I make 2 loaves of banana bread for them and bought boxes of tea for this year. Maybe next year I can try something like this. Isaak's in 2 preschools: That's 4 teachers. Mica's only has 1 teacher. This year I made a lot of banana bread. Then Isaak's preschool was canceled. At least banana bread freezes well. See, those 5 teachers gift's really add up! My problem is my daughter wants to gift to the crossing guard, the lunch ladies, the librarian, ect lol. Banana bread is a great gift idea! Oh what a thoughtful gift! I never thought to make scrubs on my own either! A student gave me one of these a few years ago, and I loved it! However, her homeroom teacher took a bite out of it by mistake. Tee hee. I can just smell how good this smells. What a great idea!! My Hubs loves sugar scrubs. I've made sugar scrubs as gifts before but I really like the cherry juice and then alternating the colors so you have a candy cane in a jar. This is such a great idea!! I love buying sugar scrubs for gifts, but when you are trying to stretch a budget it is almost impossible. I am going to use this and make as many as I can for gifts. Thank you so much for sharing!! This is so cute and such a good idea! Sugar scrubs are so expensive, that I would prefer to make my own, and I think the kids would like doing it as well! Great write-up...thank you for sharing! sounds amazing I bet it smells amazing too!